LinkedIn is the most extensive professional online network. With over 400 million members and well over 3 million company pages, you can’t afford to ignore it. The problem is, having a half-hearted LinkedIn profile is almost worse than not having one at all and it can be particularly hard when you’re in the process of reskilling. Who should you be connecting with? How do you make your previous experience relevant? How do you attract recruiters? Today we’re looking at 10 top tips for creating a great LinkedIn profile – use the tips below along with our LinkedIn checklist to create the perfect profile. Here are a few things to consider – where to find inspiration and how to avoid annoying people as you get more traction. What language do they use – make a note of recurring job-specific keywords? What skills are they highlighting? …These are all great insights and should definitely be your starting point for inspiration. If you’d rather be checking out these pages anonymously, make sure you’ve changed your privacy settings. Secondly, if you have any connections at all, it’s advisable to turn off your ‘activity broadcast’ before you start making changes. If you don’t do this, every change you make to your profile will appear in the newsfeed of your connections – and that’s incredibly annoying! 1 – Setting the Tone. Your LinkedIn page is more than an online copy of your CV and it’s a chance to show potential employers a little more personality. You should write in the first person and be a little more conversational in tone. 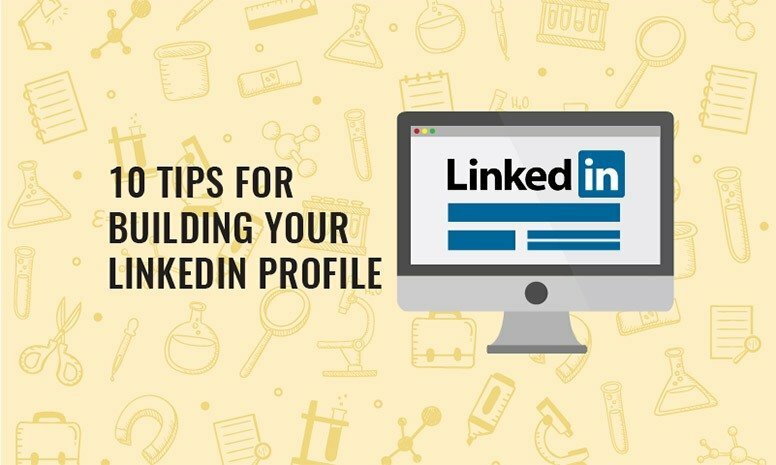 You should definitely add a photo – profiles with photos always get more attention and on LinkedIn, it’s the norm. Your photo should be a professional looking headshot that is well lit and high quality – no holiday snaps or photos from a night at the pub! 2 – Your Professional Headline. Your headline should be catchy and contain the keywords you want to be found on. Use keywords relevant to the industry – hiring managers and recruiters search for candidates by job title. When you’re looking to change industry, it can be a good idea to put in the job you’re aiming for (e.g. “Looking for process technician opportunities”). This section is similar to the personal profile section of a CV, it’s where you give people a brief overview of yourself. Again, think about keywords used in jobs descriptions in the pharma industry or on the pages of professionals already in the industry, to show you understand the sector and the qualities important to work in it. This is the prime place to explain that you’re reskilling into the industry, perhaps your motivation for that, and to highlight the strengths that make you a good candidate for the industry. When adding previous jobs into the ‘Experience’ section, add details and not just a job title – list your responsibilities, achievements, and skills that you gathered. Be sure to highlight transferrable skills that are desirable in the pharma and medical device sectors (e.g. Ensured adherence to strict quality control procedures). You can also use this area to link to any projects or achievements that have a profile on the net. This is where your networking begins. Search through your school, university and previous colleagues to find contacts. Even though it’s a professional network, you should still add friends and family as this will increase the number of people you are ‘closely’ connected to and able to contact. Once you start doing this, you’ll find a page of suggested contacts – spend some time every-so-often going through that list to see if there’s anyone else you can add. You should always take the time to personalize the message sent with your connection request. You shouldn’t start randomly adding contacts – if you have a genuine reason to try to connect with someone you don’t know, you should take the time to write them a message explaining why you should connect. Search for relevant groups in the field you’re interested in, this lets unconnected people who are in the industry see you and your ideas. Once you’re in a group, participate! If you know answers, provide them, or ask intelligent questions. Joining groups has other advantages as well – you may find relevant jobs are listed here, you may hear about industry events and ‘in person’ networking opportunities and you can connect with people in the same group. Ask people you know well for recommendations. This is a short paragraph written by them, displayed next to the relevant role, and is a great way for prospective employers to see some feedback. If you’re thinking about doing this, discuss the features and skills of your previous role that are of most use on your profile page. Try to get as many of these as possible. Your profile reflects you and your character. If you’re applying to pharmaceutical and medical device manufacturing, you want to be seen as someone who has a keen attention to detail, who takes pride in their work – take the time to double check your spelling, grammar, and narrative. This is a professional network, it isn’t Facebook. You should conduct yourself in the same way that you would in a workplace. That includes only talking about people like they’re in the same room, being constructive and positive wherever possible, and always replying to messages (even if it’s a polite ‘no thank you’). 10 – Keep it Up To Date. As your experience grows, make sure your LinkedIn profile reflects that. Your page should be an accurate reflection of your current skills and achievements to give yourself the best chance of attracting recruiters. Jobs, groups, and connections are all suggested to you on the basis of your profile – another reason you need to make sure it’s giving the right message! Finally, after you’ve done all of the above and you’re happy with your LinkedIn profile, include a link to it in your email signature and on your CV – make it easy for employers to find and connect with you. You can (and should) change the public profile URL of your account, the default setting is a string of random numbers and letters, you can change it to something more meaningful (and concise! ).